Dingo Den foster carers provide much-needed love and support for animals who need temporary care before becoming available for adoption. Placing our rescued dingoes into foster care helps to give them the strength and confidence they need before they can be adopted into their new forever homes. Our foster carers are unique individuals and families who dedicate their time to nurturing and saving the wild-hearted. 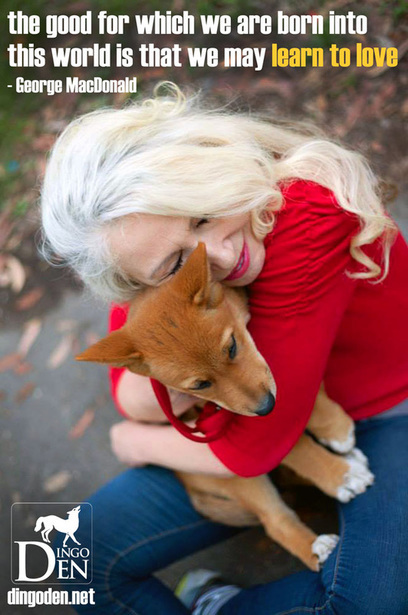 One of the most rewarding experiences as a foster carer is watching a rescued or previously owned Dingo find their true self, learn to be social with other pets and enjoy living the life of a Dingo. By immersing these much loved animals into the home environment, our diligent carers are able to assist the growth and development of the dingo, until they are ready for their forever home. For some carers, the experience of fostering a newborn or senior Dingo can be even more rewarding. These beautiful canines are in desperate need of human understanding and contact, and to the special few fostering these animals, the experience can be life changing. If you love these gorgeous canines but cannot commit to adopt permanently, you might be a good candidate for becoming a foster carer. If you are interested in opening up your home and nurturing a rescued dingo, please fill out the form below. If you would like to learn more about what caring for dingoes is like please see the Dingo Care section of our website. If you have any questions about foster caring please contact us via our Contact form. To begin our foster care application we would like to gather some information about you, your home and your interest in dingo care. This helps us match you with the most suitable dingo. Please take some time to carefully complete our application form below. ​Home truly is where the heart is and that's why Dingo Den Animal Rescue is dedicated to ensuring that carers genuinely get to know the wild and beautiful hearts of their dingoes. We expect an honest and open relationship with our carers. We welcome those who wants to foster a dingo and we want to get to know you so the right dingo can be placed into your care. Our application process starts with a survey to get to know the environment and lifestyle in which you will be introducing a dingo. We then make contact through email or phone to discuss details and options. ​Helping others understand and appreciate dingo nature is the key that enables dingoes and their carers to live the happiest, healthiest and most rewarding lives imaginable. We empower our carers to provide the best care possible for dingoes through one-on-one mentorship. Our volunteers are happy to get you and your home set up for a dingo occupant. This includes training in care, helping set up your property to house a dingo, advice in feeding the dingo and activities to enrich the dingo. We are lucky enough to have wide-spread support of the Dingo Den mission due to our unique, tailored approach to care and genuine love for all dingoes and hybrids. Foster carers are local to the Sydney area as well as interstate. Dingo Den Animal Rescue’s adaptable strategies allow us to look at each case for every individual dingo in need and provide the care required irrespective of distance or circumstance. For local carers, Dingo Den personally invites you to the sanctuary and to fundraising events. We also organise foster carer mixers where volunteers and carers can get together to enjoy each others company!